As usual this large set is made up of three previously released sets plus a new collection of figures. 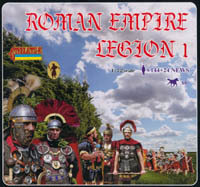 The sets that are given a second outing here are M020 - Roman Legion in Advance, M009 - Roman Legion in Battle and M008 - Roman Auxiliaries in Battle plus the horses from set 099 - Roman Cavalry on the March, so you can refer to the reviews of those sets for details. We have just photographed the new figures above, which come on two sprues, and will just be discussing these here. The bulk of the new figures in this set are devoted to what has been described as the backbone of the Roman Army – Centurions. Although the structure could vary, the typical early imperial Roman legion was made up of 10 cohorts, most of which were themselves made up of six centuries, each with about 80 men, and each commanded by a centurion. The first cohort was composed of five double-strength centuries, making a total of 59 centurions per legion. These were usually men of long service and proven military ability who could control their men and lead from the front when it came to a fight. Essentially all the figures in our first three rows look to be centurions, in a wide variety of poses from battle to being on the march. Finer details of their dress varies, as it should, but the common features are a transverse crest on the helmet (worn in battle, even when the men did not), greaves on the lower legs, the wearing of the sword on the left side and the dagger on the right (the reverse of the men’s arrangement), the carrying of the vine cane (vitis) and in many cases the wearing of discs (phalerae) on the chest. All these figures have all or most of these distinguishing characteristics, on what is otherwise a standard tunic and mail coat of various designs. One man (third row) wears no armour, but retains his military belt, weapons and vitis, so there is no mistaking his authority. He may be conducting training or simply be involved in policing duties, but is an all too rare reminder that Roman soldiers did not always wear full battle array. The variety of poses in this group of figures is extremely pleasing, with some very nice combat poses as well as some that are much more passive. The pair of a centurion being assisted by a legionary carrying a spear is reminiscent of the similar Esci pose and nicely done, but all of them are appealing and well thought out. Centurions are often depicted in modern times with oval shields, which is quite correct, but they would also often carry the same rectangular curved shield as their men, and most here do so, although one carries a less common round shield instead. The unarmoured figure in the third row could almost pass for an optio, the second in command behind the centurion, for he has no helmet or greaves as he is unarmoured. The cane that he carries could be a vitis but could also be a hastile, the equivalent for this more junior officer, although as his weapons are in the centurion configuration he is actually not an optio. The figures in the fourth row are certainly not centurions, but instead depict some standard-bearers and some more senior officers. The two standard-bearers are, from left to right, an imaginifer and an aquilifer. The aquilifer carried the Aquila, the eagle emblem of the whole legion and naturally the most important of all the standards. The precise design varied, but this one with a wreath round the wing tips is based on an ancient example and is as appropriate as any. As with many standard-bearers, this man wears an animal pelt – probably a bear in this case – and is otherwise appropriately dressed. One source suggests such men were always bare-headed, but we find that hard to accept and have no problem with the costume as modelled here. His colleague carries the Imago, basically a portrait of the emperor, which was naturally carried from the Principate onwards. Some sources suggest there was one per legion again, but there is evidence to suggest some or all cohorts of a legion may have carried one. Again the precise design varied, but this one of a head-and-shoulders bust of the emperor is typical. Although this imaginifer is also wearing an animal pelt, this one only covers the head and neck, and a cloak is also being worn. One of the centurions holds aloft a signum, which was the standard for an individual century. Designs varied considerably – they had to be distinguishable by the men after all – and normally they would be carried by a signifier rather than a centurion. The remaining three figures in the fourth row all look to be senior officers. A legion was commanded by a legate, who also had junior officers such as tribunes laticlavius, praefectus castrorum, etc. who essentially acted as his staff. Of course there might also be generals, other political leaders and even the emperor himself, so there is room for a number of senior officers. Such men pretty much pleased themselves in terms of costume, but all these figures look appropriate. They all seem to have a muscle cuirass and two have the tie belt – a symbol of their rank. Of course the helmets have magnificent crests, so everything here looks fine. The poses are good too, so these figures will prove very useful. The first two mounted figures are probably decuriones, commanders of a turma or squadron of 30 Roman cavalrymen, four of which were usually part of a legion. Both men are little different from the troops they commanded in terms of appearance apart from the crests on their helmets, and are properly done here. The third figure looks to be a messenger, and a nice touch for the set. The last row contains three more senior officers. These have much the same characteristics as the dismounted officers with the obvious and surprising exception that none are wearing a helmet. This does however allow us to better see the faces and hair styles, and we could not help but feel they all resembled any of several busts of Roman emperors of the period, although of course they do not have to represent the commander-in-chief. Quite why none of them have a helmet we could not say, and it would have been nice for at least one to be helmeted, but the poses are very good so again it is hard to complain. In our opinion these are some of the better figures Strelets have produced. The rather chunky style is still there and the heads and some other elements are really too big, but it is not nearly as intrusive as in some previous sets, and some interesting and imaginative poses go a long way to make this a worthwhile product. The centurion drawing his sword in the top row is a particularly adventurous attempt for Strelets, and while it does not completely work it is still a worthy effort. Despite there being no separate weapons or shields we can’t really say any of the poses are flat, so we were very impressed with the thought that has gone into this. The figures will still match other Strelets Roman sets and not much else, but these are really rather good, and there is no flash to speak of either. Unfortunately not all the mounted men fit the horses quite as well as they should since a few are a little too tight, but with no accuracy problems and some good ideas this is a surprisingly appealing set. Lacking perhaps only a musician or two, we thought this was the best Strelets effort for quite a long time.